A Complete Physics Resource for preparing IIT-JEE,NEET,CBSE,ICSE and IGCSE. All Physics topics are divided into multiple sub topics and are explained in detail using concept videos and synopsis.Lots of problems in each topic are solved to understand the concepts clearly. Whenever heat energy is given liquids are also going to expand like solids. The force of attraction between the liquid molecules is bit less when compared with the solids and hence expansion is going to be more in the case of the liquids. Solids have a specific shape and hence they have linear expansion, areal expansion and volume expansion. Liquids don’t possess any particular shape and they acquire the shape with respect to the container. As a result liquids have no linear and areal expansions and we can study the expansion of the liquid is only through volume expansion. Solids have an advantage that we can supply the heat energy directly to them. But liquids have to be taken in a container and then heat energy has to be supplied to the container. First the heat energy is absorbed by the container and it expands. After receiving sufficient energy it will further pass it to the liquids and the liquid starts expanding. At the initial stage when the solid is expanding it appears like the liquid level is falling down. It is because of volume expansion of the solid container. Therefore liquids have two types of expansion coefficients. One is the apparent expansion coefficient and the other one is the real expansion coefficient. Apparent expansion coefficient of a liquid depends not only on the nature of the liquid but also on the nature of the container. Real expansion coefficient of the liquid depends only on the nature of the liquid but never on the container of the liquid. 1.Consider a liquid in a long necked vessel as shown below. Let the liquid is filled up to a level A in the solid container. 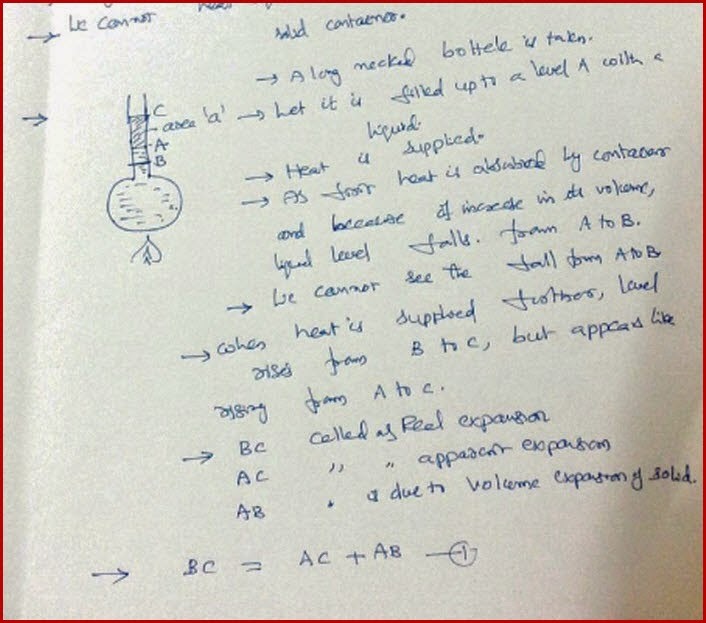 2.When heat energy is supplied as the container expands the liquid level falls below the given level to B. A human eye cannot identify it because its value is small. 3.When the heat energy is further supplied the liquid level rises from the lower level B. 4.Though it appears like liquids is raising from A, it is actually raising from B. The expansion appears for as from A to C and it is called apparent expansion. 5.Expansion of liquid really happens from B to C and it is called real expansion. 6.The real expansion of the liquid is equal to the sum of apparent expansion of the liquid and the volume expansion of the solid container. Coefficient of apparent expansion of the liquid is defined as the ratio of apparent change in the volume of the liquid to its original volume per 1°C rise in temperature. Coefficient of real expansion of the liquid is defined as the ratio of real change in the volume to its original volume per 1°C rise in temperature. A liquid is taken into different containers having different coefficients of linear expansions. The apparent expansion coefficient in one of the container is given then what is the apparent coefficient of expansion when the liquid is in the second container? The concept behind the problem means coefficient of real expansion of a liquid depends only on the nature of the liquid .As the liquid is same, even though the containers are different it is going to have the same coefficient of real expansion. Basing on this concept the problem is solved in the above-mentioned diagram. A glass vessel of 1 liter volume how much of the mercury has to be filled so that the level of the mercury remains constant at all temperatures? 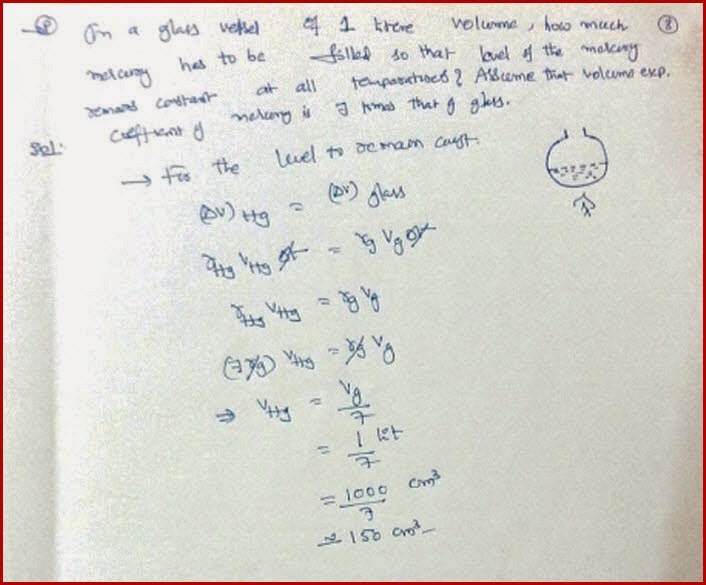 Assume that volume expansion coefficient of mercury is a seven times the volume expansion coefficient of glass. In solving the problem we have to apply a simple concept. If the level of the mercury has to remain constant at all temperatures, increase in the volume of the mercury shall be equal to the increase in the volume of the glass vessel. 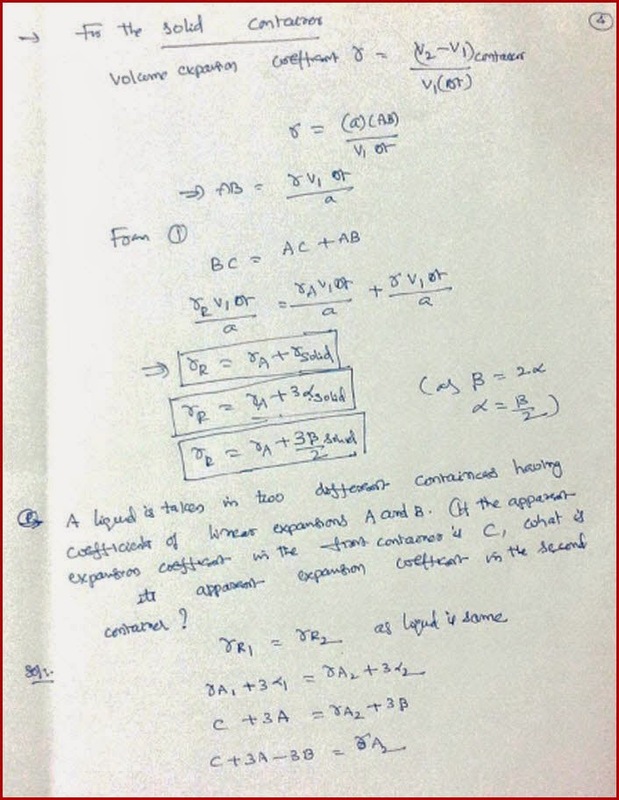 To measure the apparent expansion coefficient of a liquid we have a small formula. It is the ratio of mass of the liquid expelled to the mass remaining per unit rise in temperature. 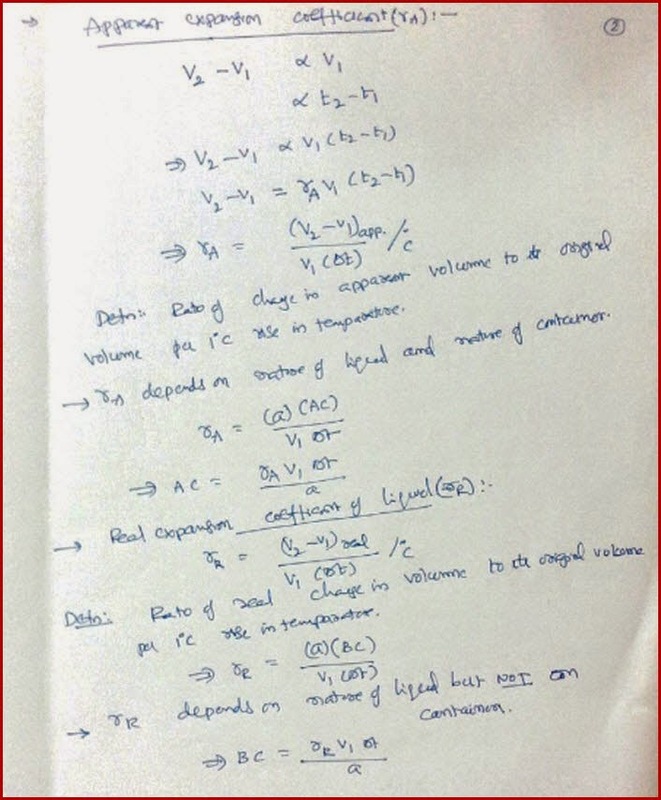 What is the original volume of 'apparent change in volume' in calculating coefficient of apparent volume expansion of liquid?Is it the volume we take in vessel initially or is it the volume of liquid left after heating? Is linear expansion is possible in the case of liquid.Explain.